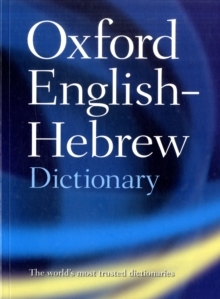 The Oxford English-Hebrew Dictionary is a landmark in the description of modern Hebrew. Hailed by the Jewish Chronicle as a `tremendous advance over previous works', it provides a unique description of Hebrew language as it is encountered and used today, covering formal and poetic Hebrew as well as current idioms and phrases, slang and colloquialisms. Descriptive not prescriptiveThe first dictionary to describe rather than prescribe contemporary Hebrew. Exceptionally wide coverageCoverage of technical and scientific terminology; academic discourse; vocabulary from fields such as law and medicine, as well as slang and colloquialisms. Clear labelling systemThe labelling system allows quick identification of context, register, and usage. Essential referenceA reference tool for students, scholars, translators and business professionals.